Today is the 25th anniversary of the last Citroën 2CV rolling off the line in Portugal, the last factory to make the legendary Tin Snail, which had been in production since 1948. To commemorate this anniversary, I want to talk about one of my favorite 2CV stories: the one with the crankcase full of bananas. This particular story comes from a 1967 Dutch Citroën brochure called Highlights from the History of the 2CV, though I’d actually heard this story — and many similar variants with different cars — before. 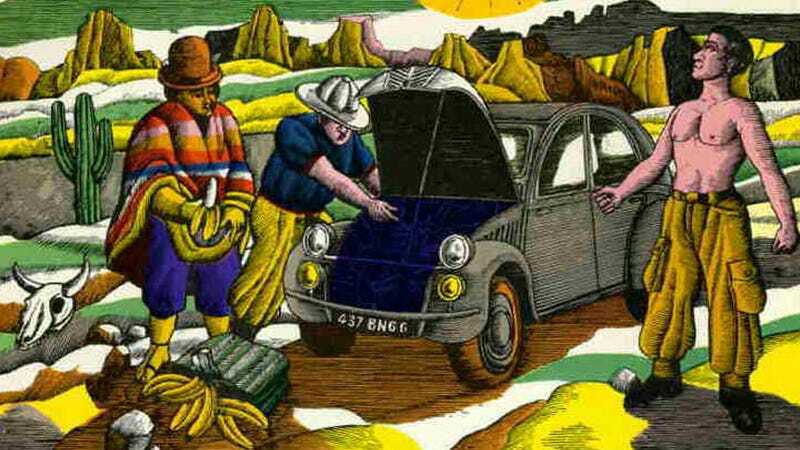 This 2CV-based retelling seems to be the most popular and best supported, though. The basic idea of all of these stories is always the same: in fact, I first remember hearing a version about a VW Beetle-based off-road racer called Bugazon, and the basics are very similar to this 2CV version: a car in a grueling off-road race encounters some accident in the middle of nowhere, causing it to lose all its oil. The team has no oil left, so some wise old native (or young native) gives them the idea of using a bunch of mushed-up bananas in the crankcase to lubricate the engine. On February 15, 1959, Jacques Seguela and J.C. Baudot are crossing the Atacama desert in Chili [sic] with their 2CV. They left on October 9th 1958 Perpignan (in France) for a trip around the world, from which they had completed then more then a quarter: 25.000 kms. though Africa and South-America. The 2CV drives brave across the “washboard” shaped surface of the plain, untill suddenly there’s a horrible crunching and rattling from the engine! They stop, look and diagnose the extent of the disaster: not one single drop of oil left, the cap of the oilcarter has gone off through the enormous shocks. This is the end of the 2CV and also that of the explorers because all their reserve has gone; all oil supply has been used earlier. Both exhausted man shall have to wait for the unlikely help of an even unlikely truck to pass by. For them it’s the end of their journey around the world, exact in the middle of a plain of 3000 kms., where there are golddiggers graves now and then, full of crumbly rocks that form alarming shaped on the horizon. But, suddenly, as if fallen from the sky, a big indian appears. He comes closer and observes in silence the desperate gesticulation of both young men. Then he gets a number of bananas from his bag, peels them and tucks them into the oilcarter one by one. With this original lubrication the 2CV starts again without any alarming sounds. And after that it drives 300 kms. without any difficulty. Seguela and Baudot finish their trip around the world: the first worldtour of a French car: 100.000 kms. In this particular case its a washboard road in South America, and a “big Indian” that “fell from the sky.” It’s the same basic story, exotic locales, shamans, and bananas shoved in an engine. There are some variants from WWII that dispense with the shamans and mystery and replace it with the desperation of war, but the result is always the same. I believe this actually did happen, and actually did work. On perhaps many occasions — the story is just too widespread for me not to think there’s some truth in there. Perhaps at some point if I find a suitably/possibly-sacrificial engine, we’ll have to give this a real test. Anyway, it’s as good a reason as any to give some thought to the legendary Deux Cheveaux. I’m also really curious to know if anyone else has heard variations of the bananas-in-the-crankcase stories, too!